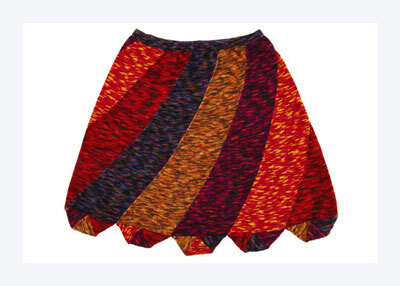 Combining five colorways of hand-painted yarn, this knitted modular skirt draws on the strengths of the spiral: energy, motion, and decreasing diagonal lines that flatter the figure. The construction is simple and fun. Work the number of modules for your size, and then seam together. Instant spirals! With MC, CO 21 sts. Row A (WS): Purl 1 row. Row B (RS): K1, ssk, knit to last 3 sts, k2tog, k1. Alternate A and B rows until 5 sts rem. K1, sl1, k2tog, psso, k1 — 3 sts. Purl 1 row. Next row: Sl1, k2tog, psso. Break yarn, leaving last st live for reuse. With CC1, pick up and knit 20 sts, beg at lower-right edge of Triangle 1, knit last live st from Triangle 1 — 21 sts. Rep from Step 1 to form Triangle 2. Change to CC2 and rep Step 2, then Step 1, to form Triangle 3. With CC3, pick up and knit 43 sts along long edge of triangles module. Purl 1 row. Work bias St st rows. Row A (RS): K1, M1R, knit to last 3 sts, k2tog, k1. Alternate A and B rows until piece measures 5 (5-1⁄2, 6, 6-1⁄2)” from beg, ending with a B row. Next row (RS): Work to center 3 sts, sl1, k2tog, psso, work to end of row. Rep centered double dec every 22nd row, 7 more times — 27 sts. Purl 1 row. Place live sts on holder. To accurately measure the length of your spiral module, first lay it flat. 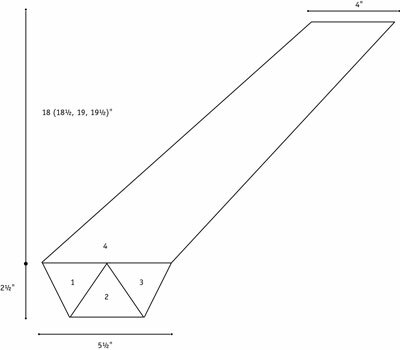 Then place a ruler with its end at the bottom edge of the center triangle and its edge parallel to one column of stitches. Using 4 different colors each time, make 8 (9, 10, 11) more modules. Weave in ends and block each module. Arrange all modules into the color progression you like best. Working from bottom to top, seam modules together with tapestry needle and mattress st. Open spaces should form between the triangle modules, as shown. Weave in ends and steam lightly to block seams. 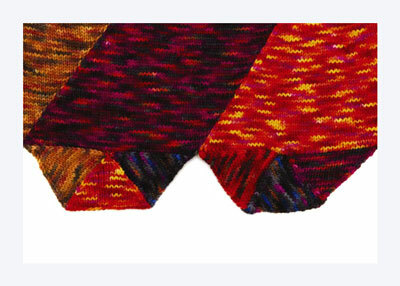 When seaming the modules together, try using the knitted or crochet joining techniques to add a new color and emphasize the diagonal lines in this garment. Place 243 (270, 297, 324) live sts around top edge on circular needle. With CC4, work in St st for 1-1⁄4″. Purl 1 row for a turning edge. Work 1-1⁄4″ in St st. BO. Fold waistband to WS along purl row and pin in place. Sew in place by hand, invisibly from WS, leaving a 1″ opening to insert elastic. Draw elastic through waistband using a safety pin. 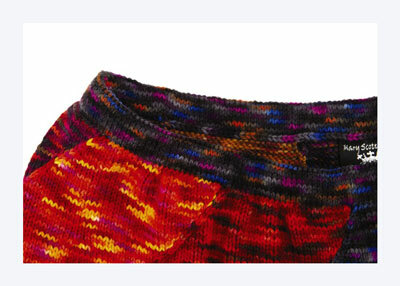 Overlap ends by 1″ and sew securely together. Sew opening in waistband closed.